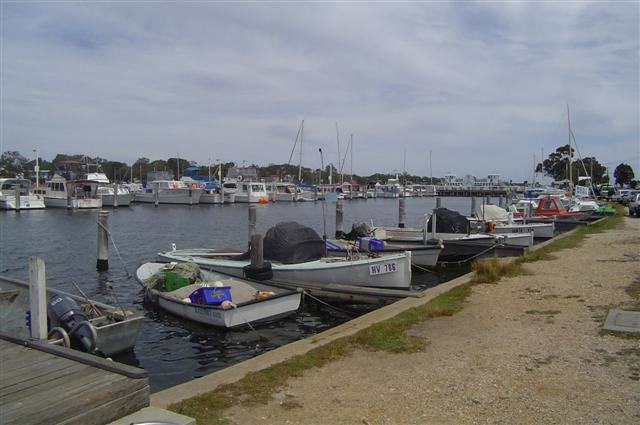 run by Barry and Carol and boasts an inground pool, recreation room, and a playground. with a steak and salad, and a fresh fruit salad. A pleasant evening, a few stars out, and a cool, not too strong breeze; not a bad end to the day. The sun was shining the next morning and the wind had eased a little; some good weather for fishing, said John. 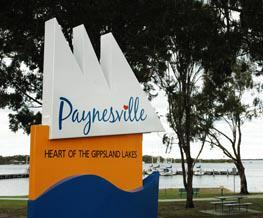 But I wanted to have a look at Paynesville first. Surrounded by water on three sides, the first impression was that there were boats, boats, and just for something different, some more boats! Surprisingly, there’s quite a boating culture here in this family friendly town. Who would have thought . 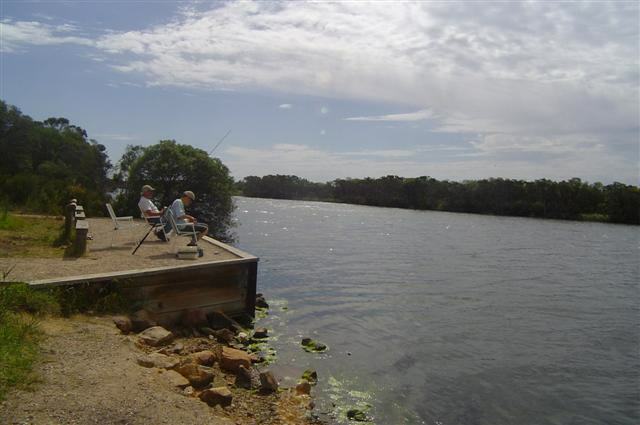 . .
John asked one of the locals about fishing and was told that one of the best places was at Eagle Point, where the Mitchell River enters Lake King, a few kilometres to the north. The Bluff Lookout at Eagle Point was very interesting. 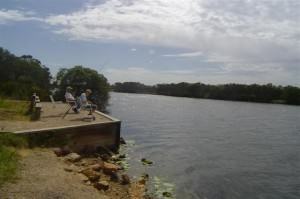 You can see as far as Bairnsdale, the gateway to the Gippsland Lakes, just over 18 kilometres (11 miles) away, and the Mitchell River Silt Jetties. From the mouth of the Mitchell River to Lake King, some 8 kilometres (5 miles), these silt jetties are second in size only to those of the Mississippi River in the United States. We took the road out to Eagle Point, following the Mitchell River; John was looking for a good spot to drop in a line. I was amazed at the size of these bodies of water; it’s hard to believe that they are rivers and lakes and not the ocean! We wandered down to the marina to check out the ferry times before heading back to camp. The Marina is huge and stretches all the way along, and on both sides, of the McMillan Strait. The ferry to Raymond Island departs from the marina. Raymond Island is a natural lake island located approximately 200 metres (660 feet) off the coast of Paynesville, in the middle of McMillan Strait. 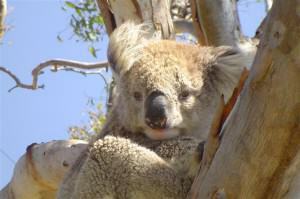 The island is 6 kilometres (3.5 miles) long and 2 kilometres (1.2 miles) wide and is home to a large koala population. 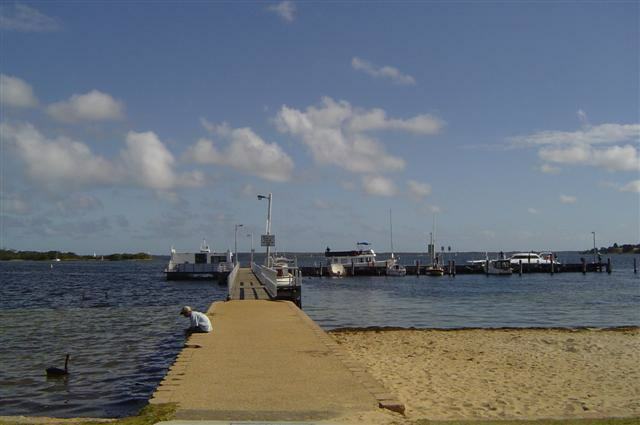 We returned to camp for a quick lunch and John started to get the fishing gear ready but Sean had made friends with some of the other young people at the caravan park and he wanted to go swimming with them so it was after 3:00 before we left for Eagle Point and the fish. “Fish dinner tonight!” John declared. Luckily I’d bought a barbecued chicken anyway. All along the stretch of road out to Eagle Point there were parking bays and fishing areas and some even included toilet amenities. John and Sean threw their lines in and I settled down with my book but it wasn’t long before I started to burn and had to go and sit in the car; sunburn, even with sunblock, is the curse of fair skin. The boys fished for over two hours, had plenty of nibbles, and something kept taking the bait, but no fish. And no fish dinner, either! Smart move buying that chicken! On the way back to camp we stopped on the side of the road to watch some kite-surfers in action. I was fascinated and John said he wouldn’t mind giving it a try. Now, he’s been sailboarding and used a surf-ski so I suppose this is not too big a jump (literally) for him but me, fascinated, yes, but not in this lifetime! The wind picked up again this evening and by the time we went to bed it was quite strong. Strong and warm. Hmm. That can’t be a good sign! The wind abated completely just before 2:00 in the morning and the rain came tumbling down. And down. Very heavy rain fell continuously from that point on. At 7:00 I got up and found everything wet. And I mean everything. Outside the tent was a huge swamp and the water had run underneath us and was coming up through the floor. I started trying to wipe things off and stacked non-waterproof items on top of waterproof ones. Not that it made much difference but it gave me something to do. By the time John dragged himself from bed it was after 8:00 and he only got up because the bedding was wet! Sean’s tent was almost totally drowned and poor Sean along with it. visitors here did say that this weather was very unusual so I suppose drainage has never been a problem before. The rain finally stopped at about 10:30 and the sun poked its head through the clouds but the wind was back. And it actually proved a blessing. Whatever was still wet, and that was just about our whole camp, was hung outside and, confident that it would all dry, we went off to Bairnsdale to do some sightseeing and shopping. There were some roadworks along the road but we were in no particular hurry and the hold-ups were brief anyway. 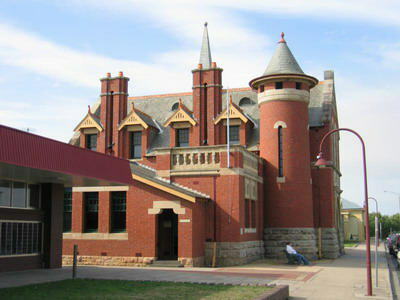 Bairnsdale is located on the river flats of the Mitchell River, the town dates back to the 1850’s. It’s quite a large town and we strolled down the main street looking at shops, found the local bakery and supermarket, even bought an umbrella in case of any more rain, and visited the information centre. The information centres are an absolute must for any traveller; as the name suggests they are a hive of information on local areas, tours, and places to see. They almost always have maps, and souvenirs and postcards for sale. We soon headed back to camp for lunch and, yes, everything was dry, even the puddles had disappeared. So we took our time over lunch and decided what we wanted to do this afternoon. A visit to Raymond Island for a spot of fishing and some sightseeing sounded good. The only way to get to the island is via the car ferry and what appears to be the main street on the island is directly opposite the Paynesville Esplanade. I imagine that, in the right weather conditions, you could probably call out to someone on the other side. The ferry to Raymond Island runs every half hour on the quarter hour and while we waited for it we walked around the marina for a while. There were a lot of sailboats out and they certainly had good conditions for it. And not just sailboats. It seemed that everyone was taking advantage of the beautiful day to get out on the water. In spite of the wind it was still a smooth ride across the strait to Raymond Island. There is quite a large community on Raymond Island and the ferry is their only route to the mainland. We drove around the island to the side that faces the ocean but the wind was strong and quite cold there. John and Sean wanted to do some fishing but this was not the place for it this day. This was in total contrast to the calm waters of McMillan Strait; inshore it wasn’t too bad but a little further out it was very choppy. upset about it and he graciously lifted his head for photographs before going back to sleep. Raymond Island is not just home to a large population of koalas, there are kangaroos and wallabies as well. It’s generally regarded as a great place to see these beautiful creatures in their natural habitat. There are also over 160 species of birds on the island and a huge flock of swans that cruise serenely along the strait. The swans found our bait particularly interesting, not that it mattered because, again, there were no fish. We returned to the ferry in the early evening and back in Paynesville picked up a pizza for dinner before heading back to camp. The evening had become cool and the wind was still blowing but at least it wasn’t raining and so our last night here was a quiet one spent mostly inside the tent where, if nothing else, we were out of the wind. The sun was shining, the temperature climbing, and the wind gone when we got up this morning and, wouldn’t you know it, we’re leaving today! 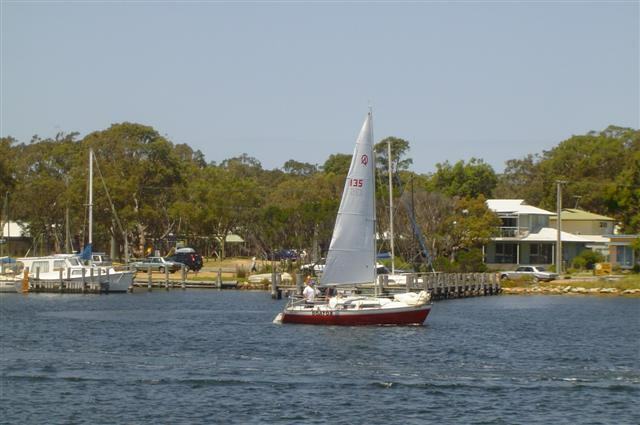 The tourist brochures will tell you that Paynesville is quietly sophisticated and has been likened to the Riviera by the boating community. Why don’t you come and see for yourselves; we think you’ll be impressed by what you find.